After our meeting with with Steven Cull and Philippe Lozier from Samsung to talk about Knox and SAFE, we got the unique opportunity to try out a pre-production unit of the Samsung Galaxy Note 8.0. We already knew that the Note 8.0 would be headed to Canada in Q2 2013 and now we had a bit of one on one time with the device to see how it stacks up to a Nexus 7 or an iPad Mini. Unlike the version ridiculed by tech journalists for having cellular capabilities as well as an earpiece to hold up to the ear when making "a call", the one we had a chance to try out was the WiFi only version that we expect to hit Canada in the coming weeks. 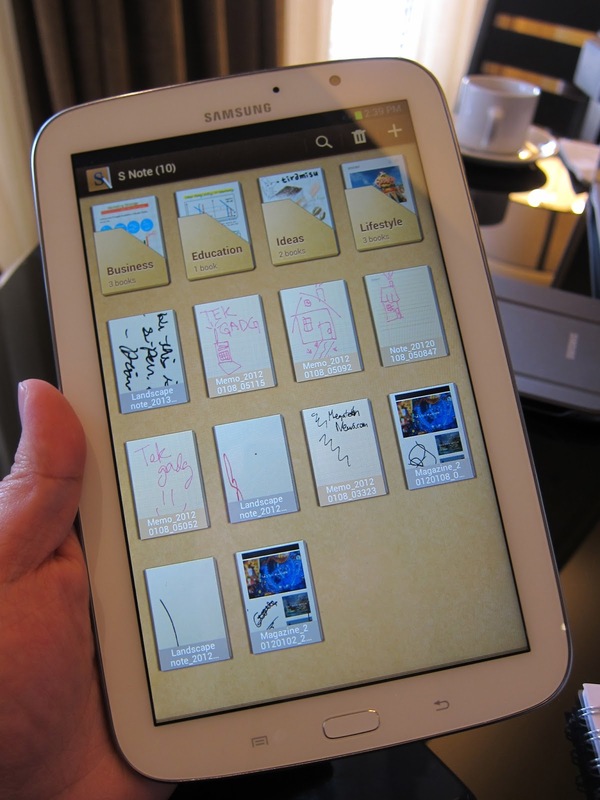 It was more along the lines of what we expect in a mid sized tablet but with S-Pen capabilities. Overall design reminded us a lot of the Galaxy S III as well as the Galaxy Note II (naturally). We believe this is a good way of conveying the strong brand Samsung has created with the "Galaxy" brand. If you've tried a Galaxy Note II or Galaxy S III, the Note 8.0 will feel very familiar. The Galaxy Note 8.0 felt nice in the hand, really light weight and very thin, comfortably slotting itself in between the 5.5 inch Galaxy Note II and 10.1 inch Galaxy Note 10.1. The unit we tried out was nestled comfortably within a Samsung branded folio case, not unlike the one sold for the Nexus 7 on the Google Play store. The S Pen was more substantial than we had seen on the already improved Galaxy Note II S Pen which we very happy to see. Software was pre-production so there was an overlay (debug information we assume) over the homescreen so we knew software could be tweaked in the final version but in our short time with the device we noticed the same bevy of software offered on the Galaxy Note II like S Note. That's about it for our time with the Galaxy Note 8.0. We'll try to get our hands on a review unit as soon as possible for a full in depth review. For now, we give you a few more pictures from our quick session with the device.